This Malabrigo yarn is spun from the finest merino wool, bred for generations by ranchers in Northern Uruguay. The softness and squish of this yarn is simply unparalleled. A delicate lace-weight single, it blocks like a dream and creates a fabric that is the very definition of comfort. 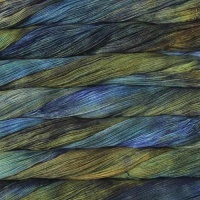 Great for: Lace, shawls, scarves, lightweight garments. Works well double-stranded for accessories, garments, and colour work!